Man, I thought this day would never get here! to finish all of my intended projects. caught the Zombie contagion back in the 80's. favorite Zombie movie, with "Fido" running a close second. I was always just a fan of Zombies until a couple of months ago. I decided to start creating my own Zombies. Not only that, but I was going to do it in an Eco friendly manner. unsuspecting statuary that could use a new paint job. This was my first creation. Who can't help but smile at a ZomBuddha? some of them in my Etsy shop. He does know how to work that camera. And his eyes glow in the dark. I went a little light on the gore for this one. I think she is tastefully Zombified. Parts of her gown glow and so do her eyes. What goodies have you brought for me, Santa?! Oh! Umm, ... that's okay. You can keep that. creepy, handmade Hallowe'en items and decorations. 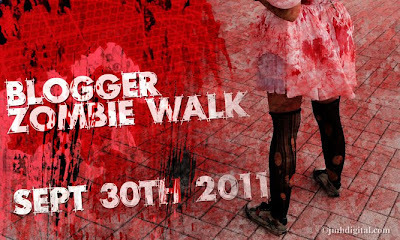 Below is a list of all of the participating Zombie Walk blogs. Feel free to hop, skip, jump, or shamble at your leisure. this week is to make a Hallowe'en scene. and the Headless Horseyman for this framed scene. also from Make it Crafty. to the raised details. I really like how it turned out. of the background with is giant bolts. It kinda looks like he's been replaced by the Headless Horseman. Those reanimated brides can be so fickle! I have to admit that I originally colored the Bride as a ghost. out of all the edges where sparkly moonlight may fall. it translates well here, but it does look pretty cool in real life. Now I said something about Zombies didn't I? Well this Friday is the Virtual Day of the Dead if you will. and admire the ZOMBIE, from the comfort of your own home. What a great way to kick off the coming season!! recipe, etc... to fill your appetite for the undead. I have been soo busy working on some killer pieces for this event. I am so excited to show my new Zombified creations!! Please drop by tomorrow and see what I have been up to. along at your own risk, I mean, leisure! Wretched Wednesday HDH108 You're Making a Scene!!! Can you feel the crispness in the air yet? A little retail therapy really helped my mojo this week. I kinda went cwazy on this challenge. for this week's Macabre Monday. and some awesome MIC digis, I have created a great scene!! used a dry brush technique to apply the silver and purple paints. go around the outside of the images for some Vampiric sparkle. quite a work out! LOTS of details!!!! I had to get out the magnifying specs for that one! punches togive more depth to the scene. I even managed to pop in a teeny tiny skull on one of the headstones! I popped everything up on corrugated cardboard in varying thicknesses. I topped off both of my Vampyres with Glossy Accents. lady since she is outside of the glass. I love this house image!!! and outlined the entire house in Sakura Stardust pen. I also added some rhinestones. More sparkles! There is still time to play along with HDH this week. week's prize schwag. But ya gotta play! the Hallowe'en spirit into your home! Some even glow in the dark!!! peruse all of my hand crafted Hallowe'en goodies! my mantle for about a year or so now. and creepy bits and bobs. show you something totally new. I got this awesome little cabinet for my birthday. My friends are finally catching on as to how easy I am to shop for. Thrift store finds are my favorites!!! and placed them on the shelves in an eye pleasing manner. collection to fill in the blank spots. own personal collection, please visit my Etsy shoppe. Uh oh! Someone left the lid off the Zombie Virus!!! Mike's tomorrow to pick up some more with my 40% off coupon! week's challenge at Haunted Design House. It was my Sister Minion's Birthday. I made Teri this pretty card to match her sparkling personality. just Steampunkish enough for Teri's discerning taste. but the camera never seems to see it. where she is the sole artist and creator. Drop by her shop and check out her amazing artwork! is carrying her images in rubber now. Yup, she is that awesome!! and I hope she can forgive our absentmindedness. Happiest of Daze to you Teri!!! advisable if you like free prizes), then please start here. chock full of everything a good crafter loves! Tickled Pink Stamps and Simply Betty Stamps. in the past, and one thing I can say is, "that is one funny chick!". called, Zombie Kellita, also available at Graphicat Designs. See? I told you it was funny! Obsessed and Crazy Momma, Tanya!!! orders from now until September 26th. all of the participating blogs. participants for a $25 Graphicat Designs Gift Certificate. or wishes that the other lacked it." when I turn into a 'forty-something'. Boo hiss! Can you feel the envy starting to creep in yet? How about now? Any signs of envy yet? Check out these AMAZING embellies!!! All totally handmade and so detailed!! She needs to be selling these! Maggots, and eyeballs and coffins! Oh my! Check out how teeny tiny these are! Again, she should be selling these on Etsy. I'll keep ya posted. "Return of the Living Dead". I am LOVING this embellishment! The details are just wonderful on this card! and the cutest felted jack-o-lantern evah! and generous people in blogland. I will be "paying it all forward" very soon. have ever laid my discerning eyes on! This is just a small smattering of her work. Who doesn't love a mad purple bunny??!! This is "Edgar, the Destructive Bat". from the show, "Oddities" on the Science channel. "Is that a sssstraight jacket?" Check out all of the details!!! Brilliant!!! I fondly refer to this guy as a "Stitchling". also open to custom orders as well. Please drop by her shop and take a look around. cool kid on your Xmas list.